Services, QB HOUSE "Your familiar 10 minutes refreshment"
QB HOUSE outlets are located mainly at MRT/LRT stations or inside shopping centres. Please choose a location at your convenience by using the outlet search. QB HOUSE uses vending machine for purchasing ticket. This machine accepts only $10, $20 or $50 note. Please prepare $10, $20 or $50 note. Our friendly hairstylists welcome you to our QB HOUSE outlets! Check the waiting time. In QB HOUSE, we are saving time for our customers. Crowdedness is indicated by QB signal. QB HOUSE uses vending machine for purchasing ticket. This machine accepts only $10, $20 or $50 note. Our stylist will not accept cash directly from customer. Ticket number is not the quene number. Customers will be served by waiting chair queue order. This machine accepts only $10, $20 or $50 note. Kindly prepare $10, $20 or $50 note in advance . Please take a seat at our waiting chair. Our stylists will serve customer by the waiting chair numbering sequence. No smoking is allowed in our outlets. No pets are allowed in our outlets. Please put your personal belongings in the closet, just sit back and relax! The rear of the door is closet for personal use. Customer can place personal belongings inside. Kindly clearly request our stylist for the hairsytle you want. You can bring photo or magazine to show our stylist. Hair-clipper may be used for certain hairstyle. Our stylists will hold a hand mirror to let you see the side and back of your head. QB HOUSE helps customers maintain their hairstyle by just cutting grown hair, customers can keep the best of their personal hairstyle. 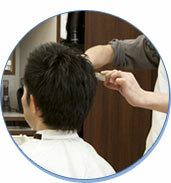 After checking hairstyle, our stylist will clean away the cut hair with the air washer. Making your hairstyle tidy and natural by using our original comb. QB HOUSE uses our original comb. 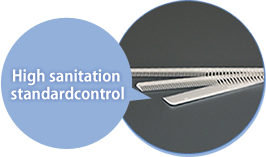 We will give the comb to each customer after use.